Governments cling to the delusion that a crisis of excess debt can be solved by creating more debt. It began as a subprime surprise, became a credit crunch and then a global financial crisis. At last week’s World Economic Forum in Davos, Switzerland, Russia and China blamed America, everyone blamed the bankers, and the bankers blamed you and me. From where I sat, the majority of the attendees were stuck in the Great Repression: deeply anxious but fundamentally in denial about the nature and magnitude of the problem. Some foretold the bottom of the recession by the middle of this year. Others claimed that India and China would be the engines of recovery. But mostly the wise and powerful had decided to trust that John Maynard Keynes would save us all. I heard almost no criticism of the $819-billion stimulus package making its way through Congress. The general assumption seemed to be that practically any kind of government expenditure would be beneficial — and the bigger the resulting deficit the better. There is something desperate about the way economists are clinging to their dogeared copies of Keynes’ “General Theory.” Uneasily aware that their discipline almost entirely failed to anticipate the current crisis, they seem to be regressing to macroeconomic childhood, clutching the Keynesian “multiplier effect” — which holds that a dollar spent by the government begets more than a dollar’s worth of additional economic output — like an old teddy bear. They need to grow up and face the harsh reality: The Western world is suffering a crisis of excessive indebtedness. Governments, corporations and households are groaning under unprecedented debt burdens. Average household debt has reached 141% of disposable income in the United States and 177% in Britain. Worst of all are the banks. Some of the best-known names in American and European finance have liabilities 40, 60 or even 100 times the amount of their capital. The delusion that a crisis of excess debt can be solved by creating more debt is at the heart of the Great Repression. Yet that is precisely what most governments propose to do. Economy Sparking Protectionism, Global Trade Disputes? The world may be on the brink of a gentler kind of trade war. In 1930, Congress fired the first shot in a protectionist battle that prolonged and deepened the Great Depression. After passing a bill aimed at saving American jobs by effectively barring 20,000 imported goods, including French dresses and Argentine butter, other nations retaliated by raising their own barriers on U.S. products, effectively bringing global commerce to a halt. In the aftermath, organizations like the World Trade Organization sought to ensure that never happened again. Nations agreed to put on economic straitjackets permitting them to raise tariffs within hard-fought limits. That is likely to help prevent a repeat of the devastating and overt trade wars seen during the Great Depression, since it is now far harder for nations to increase tariffs on a wide array of imports at once. But there remains a surprising amount of wiggle room in international trade and commerce treaties, and that, analysts say, is where the battle is now being fought as leaders worldwide face intense pressure at home to protect domestic jobs in the deepening financial crisis. They are engaging in a more subtle form of protectionism that often skirts those rules. This weekend at the World Economic Forum in Davos, Switzerland, the annual event drawing the world’s leaders, luminaries of industry, commerce and philanthropy, a host of dignitaries raised a crescendo of alarm over growing economic nationalism. “We will resolutely fight protectionism,” Japanese Prime Minister Taro Aso told reporters there, giving voice to the general sentiment. Yet even as leaders call for nations to do the right thing on the international stage, actually doing it at home is proving far tougher. British Prime Minister Gordon Brown, for instance, delivered a particularly impassioned plea for nations to remain on the path of free trade yesterday. “This is not like the 1930s. The world can come together,” he said. However, back in Britain, the government is directing British banks with global operations now being rescued with taxpayers’ dollars to boost lending to British businesses and citizens first. This week, New York University’s Roubini returned to the WEF and the Swiss ski resort of Davos as the prophet of the worst economic and financial crisis since the Great Depression – – joining the ranks of previous “Dr. Dooms” who made their names through contrarian calls that proved correct. Even as he wins plaudits for his prescience, Roubini, 50, says worse lies ahead. Banks face bigger credit losses than they realize, more financial companies will require state takeovers and the world economy will keep shrinking throughout 2009, he says. As long ago as February 2007, Roubini was writing on his blog that “the party will soon be over,” and warning of “painful consequences for the U.S. and the global economy.” By last February, his tone had become apocalyptic, raising the specter of a “catastrophic” meltdown that central banks would fail to prevent, triggering the bankruptcy of large banks with mortgage holdings and a “sharp drop” in equities. The next month, Bear Stearns Cos. failed, to be taken over by JPMorgan Chase & Co. in a government-backed deal. Then, in September, Lehman Brothers Holdings Inc. went bankrupt, prompting banks to hoard cash and depriving businesses and households of access to capital. The U.S. took over AIG, Fannie Mae and Freddie Mac, and the Standard & Poor’s 500 Index suffered its worst year since 1937. Roubini’s predecessors in the role of economic nay-sayer include some well-known names: Joseph Granville, publisher of the Granville Market Letter, who forecast the stock-market declines of 1976 and 2000; Henry Kaufman, who as a managing director at Salomon Brothers projected rising interest rates that led to a U.S. recession in the early 1980s; Marc Faber, publisher of the Gloom, Boom & Doom Report, who predicted the 1987 stock crash; and Yale University’s Robert Shiller, a former colleague of Roubini’s, who forecast the end of the dot-com bubble in his 2000 book “Irrational Exuberance” and said in a second edition in 2005 that the U.S. housing market had undergone the biggest speculative boom in U.S. history. Granville, 85, says the key to being an outlier is not to doubt your analysis. It isn’t often that two heads of state show any emotion and a public diplomatic event. A show of anger: never. Turkey’s Prime Minister Recep Tayyip Erdogan received a hero’s welcome upon his return to Istanbul on Friday following his public spat at the World Economic Forum in Davos with President Shimon Peres over the fighting in Gaza. The Prime Minister’s Office said that Erdogan assured Peres that he wasn’t angry with him, but with the organizers of the forum. The Israeli PM’s office denied Turkish media reports that Peres had apologized to Erdogan. During the forum, Erdogan had become enraged over being cut off by a panel moderator after listening to an impassioned monologue by Peres defending Operation Cast Lead. Peres’s defense was prompted by harsh criticism leveled at Israel not only by Erdogan, but also by the two other panelists, Arab League head Amr Moussa and UN Secretary-General Ban Ki-moon. “You are killing people,” Erdogan declared to Peres. Israeli election front-runner Benjamin Netanyahu told a session of the World Economic Forum on Thursday that preventing Iran from obtaining nuclear weapons ranks far above the global economy among the challenges facing leaders of the 21st century. Discussing leadership in crisis on a panel that also included British Conservative leader David Cameron, the hawkish Israeli Likud Party leader discussed the need for Israel to lower taxes and increase competitiveness if he emerges as prime minister after Feb. 10 elections. Netanyahu, a former finance minister, said he believes the global financial meltdown is reversible if governments, businesses and people make the right decisions. “What is not reversible is the acquisition of nuclear weapons by a fanatic radical regime … We have never had, since the dawn of the nuclear age, nuclear weapons in the hands of such a fanatical regime,” he claimed. Iran has denied it is seeking to acquire nuclear weapons and says it is pursuing nuclear power for peaceful uses. It also denies it is engaged in terrorism, instead accusing Israel of terrorist policies against the Palestinians in Gaza and the West Bank, which were occupied by Israel after the 1967 Mideast War. Chinese Premier Wen Jiabao brought cautious optimism to business and government leaders pondering the worst financial crisis since the Great Depression as the World Economic Forum opened Wednesday. Wen said China, a key market for companies in developed countries, believed it would be able to meet its target of 8 percent economic growth for 2009. “China remains on the track of steady and fast development,” he said but added that in the fourth quarter, growth slowed to 6.8 percent. Eight percent would be phenomenal in many countries, but would still represent retrenchment for China, where growth in 2008 hit a seven-year low of 9 percent. That broke a five-year streak of double-digit expansion. Wen spoke to the gathering of 2,500 political, business and other leaders in the Swiss Alps after an opening day of debate over state-led bailouts and worries that efforts to counter climate change would fall by the wayside. The annual meeting of politicians, well-heeled business leaders and well-meaning activists and celebrities gathered under a pall of gloom that has seen personal fortunes trimmed, companies shuttered and hundreds of thousands jobs lost. 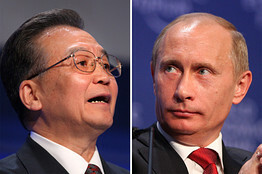 Russian Prime Minister Vladimir Putin described the current financial crisis as a “perfect storm,” while Chinese Prime Minister Wen Jiabao said his country still hoped to see 8% economic growth this year, despite economic strains. The two leaders spoke at the opening of the World Economic Forum here Wednesday night. Mr. Putin also glossed over the recent gas dispute with Ukraine, without going into the details of the rift that left many Eastern European countries without gas supply earlier this month. “Three years ago, at a summit of the [Group of Eight], we raised the issue of global energy security”, Mr. Putin said. “We called for the shared responsibility of suppliers, consumers and transit countries. I think it is time to launch a truly effective mechanism ensuring such responsibility,” adding that the current Energy Charter has failed to address key problems. Speaking ahead of Mr. Putin, Mr. Wen said his country’s growth target for this year would be “extremely difficult” to meet, but it was still attainable. Mr. Wen said the Chinese economy has already been showing small but notable signs of recovery since December. China’s economic growth slowed to 6.8% in the 2008 fourth quarter, sharply down from the 9.0% expansion in the third quarter and marking a seven-year low. For all of 2008, growth slowed to 9.0% from 13% in the previous year, posing an enormous challenge for Beijing to maintain the longstanding 8% annual growth rate that’s needed to create enough jobs to keep unemployment in check. The worldwide economic recession has exposed a “crisis of global governance” that can only be addressed by the radical reform of the United Nations, former U.N. Secretary-General Kofi Annan said Wednesday as the World Economic Forum got under way in Switzerland. 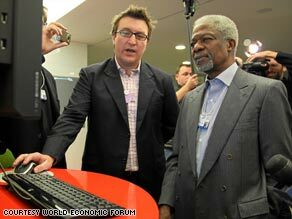 Kofi Annan says the United Nations needs to be reformed. You are currently browsing the archives for the Davos category.